Abstract. Structures built by animals, such as nests, mounds and burrows, are often the product of cooperative investment by more than one individual. Such structures may be viewed as a public good, since all individuals that occupy them share the benefits they provide. However, access to the benefits generated by the structure may vary among individuals and is likely to be an important determinant of social organisation. Here we use the massive, communal nests of sociable weavers Philetairus socius, to investigate whether their thermoregulatory function varies in relation to the size of communal nests, and the position of individual nest chambers within the communal structure. We then examine whether this spatial variation in thermoregulatory function predicts the social organisation of colonies. First, we show that the sociable weavers’ communal nests buffer variation in ambient temperature, and reduce temperature variability within nest chambers. The extent of this buffering effect depends significantly on the position of nest chambers within the communal structure, and on the depth to which chambers are embedded within the nest mass. We detected no effect of nest volume on thermoregulatory benefits, suggesting that there are likely to be additional, non-thermoregulatory benefits leading to communal nests. Finally, our results indicate that there may be competition for access to the benefits of the public good, since older birds occupied the chambers with the highest thermoregulatory benefits, where breeding activity was also more common. We discuss how the spatial structure of the benefits of the public good might influence social organisation in the unique communal lifestyle of sociable weavers. Photo (left): Sociable Weaver nest at Benfontein. The study was conducted at Benfontein Game Farm, Kimberley, South Africa from 8 September - 5 December 2010 and 23 September - 22 December 2011. Data was collected at 20 (of about 30) colonies on the farm. The ambient temperature and the temperature inside the nest chambers was measured. 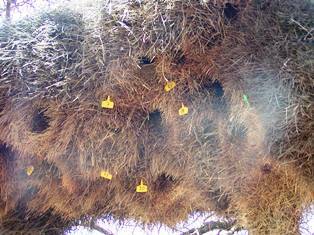 The temperature probe was inserted into nest chambers at three different positions at each colony: near the edge of the nest, at an intermediate distance from the edge of the nest, and near the centre of the communal nest. Communal nest volume was measured by taking a digital photo from each of four sides of the nest, each at right angles to each other, at a fixed distance of 10 m. A 1 m ruler with 10 cm markings was held against the nest side that was photographed for calibration. The digital images were analysed in Adobe Photoshop to estimate the length, width and height of the nest. The birds of the 20 study colonies were trapped using mist nets and were ringed with a metal ring and three colour rings. The nest chambers were labelled with a numbered tag. This study shows that the Sociable Weaver's communal nest is an effective temperature buffer, against the cold temperatures at night (especially in winter), and against high temperatures during the day. This online paper was released at the same time as Rene was presenting this talk at the "Weavers for Africa" conference!